Mortal Kombat X is a fighting video game developed by NetherRealm Studios and published by Warner Bros. Interactive Entertainment. 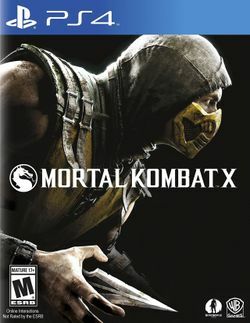 It is the tenth main installment in the Mortal Kombat video game series and was released on April 14, 2015 for Microsoft Windows, PlayStation 4, and Xbox One. NetherRealm studio's mobile team developed a version for iOS and Android devices. Mortal Kombat X was officially announced in June 2014. Like previous Mortal Kombat games, Mortal Kombat X‍ '​s gameplay consists of two players, or one player and the CPU, fighting against each other with their selected character, using a large, varied array of attacks. The game contains several modes such as a story mode, which takes place twenty years after the previous Mortal Kombat game, numerous online modes, and the 'Krypt', a mode played in a first-person perspective where players explore the areas unlocking useful items. A PS3 and Xbox 360 version was planned but later cancelled. The game has 24 playable characters excluding DLC. The DLC contains five playable characters and four guest characters that were later integrated into the special edition known as Mortal Kombat XL for the PS4 and Xbox One. This page was last edited on 26 July 2016, at 02:24.